One of my more interesting meals in India was when I went to lunch with my colleagues during the workweek. While I’m not an Indian food expert, the lunch at the Aloft didn’t seem as good as the Indian restaurant I go to in Austin. It definitely wasn’t as spicy or tasty and it was more expensive. The guys agreed that the hotel food was dumbed down for visitors and far from authentic. They promised me a more authentic South Indian food experience. Not far from the office, we went to Nandhana Palace, which has several outlets throughout Bangalore. It was the perfect lunch time place, neither fancy or plain. 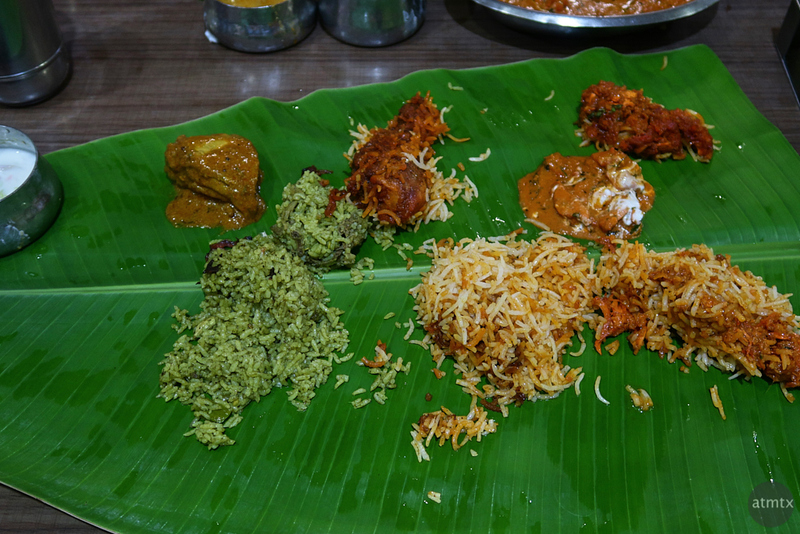 South Indian style means spicy food on a banana leaf. It has just the right amount of uniqueness to make it special for a out-of-country visitor. It sort of reminds me how we take Austin visitors to barbecue places which feature wax paper sheets instead of plates. It’s actually a misnomer that all Indian food is spicy. In many part of India, the food is not spicy at all. Two of my colleagues from the Northeast of India were impressed that I was enjoying spicier food than they were. However, true South Indian food, especially from the Tamil Nadu state, south of Bangalore, is very spicy. As you can see, there are no eating utensils. You get a very tactile experience eating with your hands, which I found very messy scooping up bits of rice. The two South Indians on the team, however, ate expertly, showing none of the awkwardness that I experienced. It’s one thing to eat burgers and sandwiches by hand, but this was a whole new, fun experience. The three rice dishes are three flavors of biriyani. We also had a few chicken dishes, each with a unique sauce. I found one country chicken dish especially spicy — really at my limits — but apparently it was only considered medium spicy in South India. The South Indian guys said that this place was about average compared to what they can get in their home state. However, for me, this might have been my favorite meal in India. 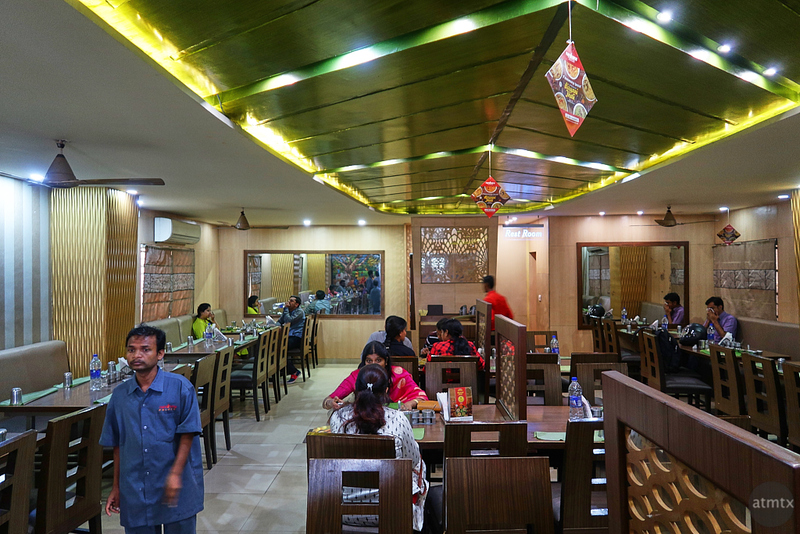 I went to fancier places but the novelty of eating differently, the flavorful food and the great company made it a memorable experience.